much love, illy: some copycat action found here. oh and can i just throw in there for free, that i absolutely loved how chilly it got over the weekend? i cannot wait till autumn temps become more consistent here in the South. i defintely took advantage of the temperatures and enjoyed some apple cider, wore a hoodie to my sister's soccer game, and wrapped myself in a blanket while watching movies. mmm, autumn, i heart you so much. p.s. don't forget to enter the adorable Lily White giveaway! p.s.s. if you are Kate (#3), you just won the fantastic Fabric + Handle giveaway. shoot me an email at muchloveilly at gmail dot com with your tote bag choice and your mail address, so we can get your bag to you ASAP! You're so pretty, you have a great smile ;) love that skirt! always adorable. love this skirt... saw it in the store and thought it was adorable! You look SO great! I LOVE everything about that skirt! You're rocking it! Yes! Autumn is my favorite season. I am definitely a big fan of either making summer dress Fall and summer colors in Fall. Who says we have to put our closets away because seasons change? THAT SKIRT! I love it! Cute re-creation! Love love love these sweet poses! Your outfits are so inspiring! 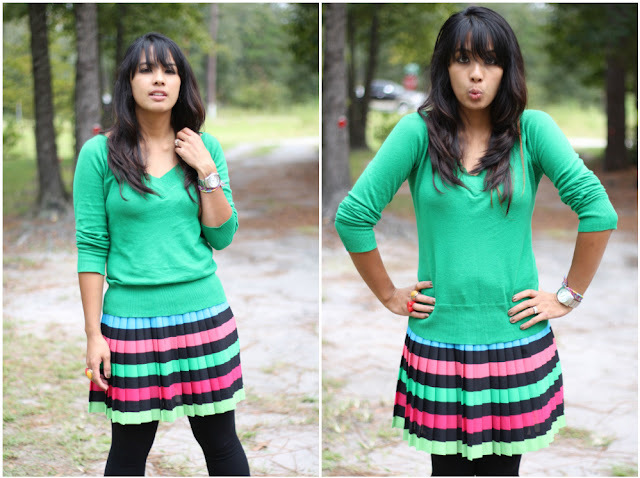 I'm new to your blog and am reading random archives, I LOVE the color green more than any other color ever so this outfit is amazing! Also, was your dad a corpsman in the Navy? That's totally what I'm doing now :) Navy pride! Love love the combination and the colour. 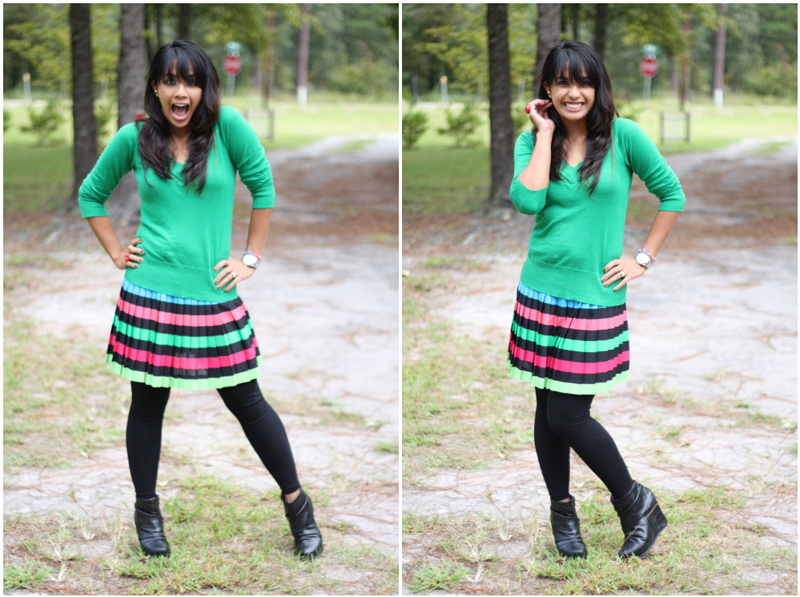 Cute skirt and green is such a pretty color on you! I love bright colors too and often enjoy looking like a box of crayons threw up all over me, only I don't make it look nearly as cute as you do! Love your outfit! I wish I was that comfortable in front of the camera! I love this look on you!!! It is so bright + cheerful! This outfit is fantastic! LOVE that skirt. I am so excited that neon is sticking around and based on NYF week it looks like it is still here for Spring as well! LOVE IT! in love with how this looks on you! I do that too sometimes! We get inspired from all kinds of places! Love the colors here! Cute, I love your copycat style! You are too cute! Your cute personality is popping in these pics! Love them! that skirt is ridiculously cute as are you! I have that same skirt in black&white, I love it, it's so comfy! love the outfit girl! you are totally rockin it. just came across your blog. can't wait to read more! CUTE! I'm excited that neon is carrying in to fall too! I'm actually wearing a neon orange tank from H&M right now! i'm in love with this outfit. like, head over heels in love. can't wait to see if I can recreate it as well! You are working this colorful look! I love to play with bright colors sometimes, so whether or not it is on trend, I intend to do it. Very cute look! I always go with tights instead of leggings in autumn/winter, though, because I feel awkward about the little line of skin that shows between leggings & booties. Just me?! It's such a good feeling when you see a look someplace & think, "Hey, I can do that!" You did this one so well. Just saw that *I* won your giveaway! So jazzed. Emailing you now! Gorgeous outfit! I love these photos! You look like you are having so much fun, I absolutely love it! You are looking gorgeous in these pics! omg i need that skirt. Ahh, I am so excited to drink hot apple cider all of the time. It's still a biiiiiiiiit too warm for me here (hahaha I am always so hot!!) to drink it on a daily basis. I overheat way too easily, ha! Love the outfit! And your poses, you are so cute! !